For 2016, the Kia K900 receives minor revisions to the exterior, courtesy of a new front grille, rear bumper tail lights and exhaust pipes, while inside an improved navigation system features a 9.2-inch high-definition touchscreen with premium audio and UVO3 Luxury Services that feature an embedded modem allowing for direct communication to the vehicle for features such as remote start/stop, remote climate control and remote lock/unlock via the UVO app. In addition, the base Premium trim is now powered by a new V6 engine with 311 hp that is also available on the Luxury trim. Further new optional features include Autonomous Emergency Braking (AEB) and Advanced Smart Cruise Control 2 (ASCC 2) system. 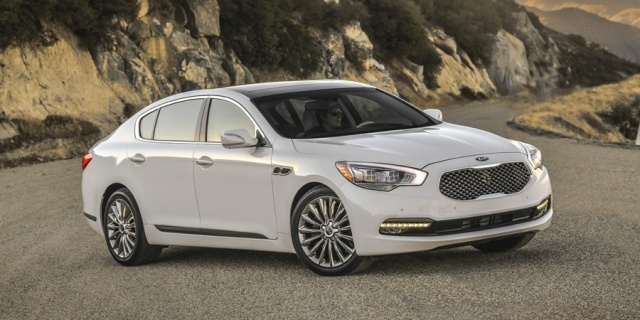 Find the used Kia K900 of your choice from a dealer in your area. Search our used car listings now.